From rocky headlands to wide-open shores, agates, seabirds, tide pools and lighthouses in the distance, the Oregon Coast is a balm for the soul. 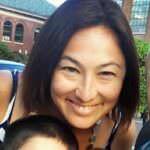 Why ride it? Because its 363 miles of glorious coastline are full of wonder, largely car-free and accessible for us all. 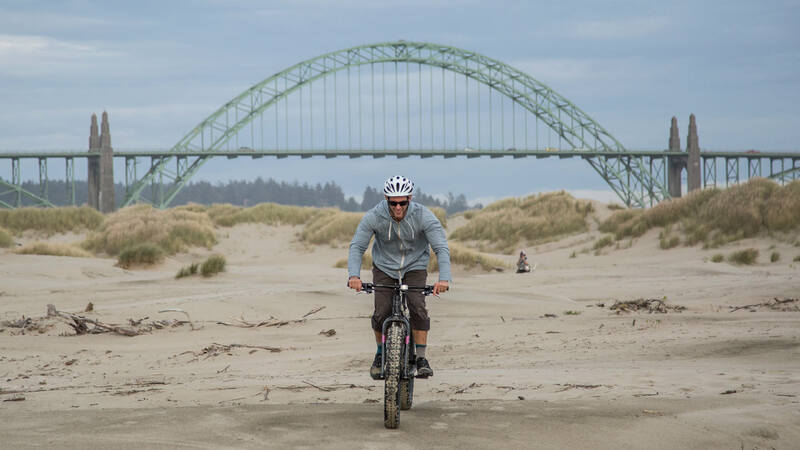 Rather than try to ride the length of Oregon Coast Highway 101 by bike — which is challenging and treacherous at times — fat-tire bikes are made for riding on sand, built with more suspension like mountain bikes and giant 4-inch tires so they don’t sink in. Thanks to many hardworking cyclists, these routes are now expertly mapped and connected; download the brochures for fat-biking the North Coast, Central Coast and South Coast here. Whether you plan an extended trip or one section, taking the scenic route by fat bike may take longer than you think, with the all of the Instagram-worthy sea caves and arches, sea stacks, and tide pools, lighthouses, rivers, old-growth forests and more natural features to explore. Here’s how to plan your idyllic fat bike coastal adventure. Ride on sand, beyond the reach of roads, on the Cape Lookout Fat Bike Route. Oregon’s North Coast beaches are best known for kite flying, dog running, sandcastle building and other modes of frollicking and chilling out. If you’ve got a bike, you won’t be far from cycle-friendly coffee shop, brewpub, restaurant or hotel nearby — you’re definitely in the center of the action. 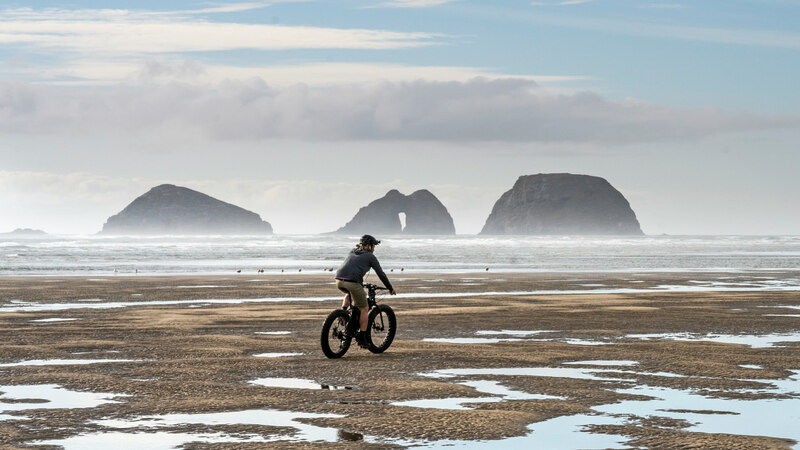 If you’re feeling adventurous, it’s easy to rent a fat bike and try one of four moderate routes: the 15-mile Fort Stevens route, which starts in Gearhart; the 6-mile Cannon Beach route, for serious views of Haystack Rock; the dreamy 13-mile Cape Kiwanda route, which meanders through Pacific City; and the 11-mile route Cape Lookout route, where you’ll likely get your feet wet around the Sand Lake area. For gear or tours, check out Bahama Mama’s in Manzanita or Portland-based Pedal Bike Tours (which rents bike racks for transportation). Enjoy great views of Newport Bridge and the coastline on the Newport Otter Rock Beach Ride. Four mapped rides on the Central Coast will get you rolling where you want to go. Starting in Lincoln City, the mild 5-mile Roads End Ride cruises through the wide-open shoreline here (keep an eye out for kite-fliers). Further south in Newport, wind your way along the Newport Otter Rock Beach Ride for 14 miles of low-tide thrills (or turn back anytime for a shorter route). More experienced riders may want to venture south for the Newport to Yachats ride — 28 glorious miles that include creek and bridge crossings and views of the spectacular Seal Rocks. Then in the whale-watching capital of Florence, intrepid fat bikers can take on the Florence Dune Exploration route. This stretch is also known for its abundance of wildlife and treasures like sand dollars and shiny agates. 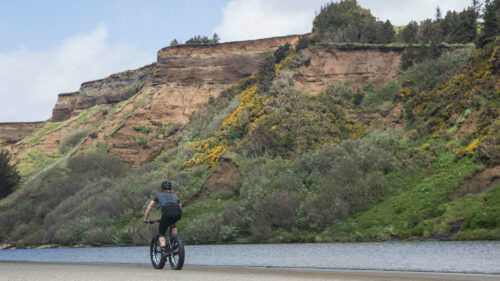 Around Florence, mountain bikers and other thrill-seekers will want to to try riding the Oregon Dunes National Recreation Area, where the bowls and ridges of the dunes make for hours of punishing fun on two wheels, like a giant sandy skate park. 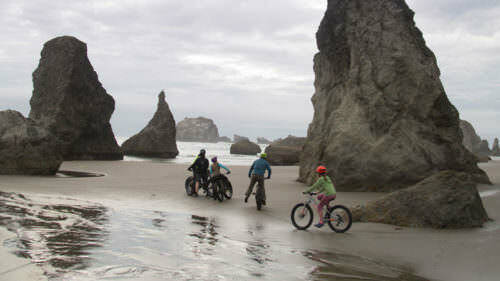 Check out Bike Newport, Safari Town Surf in Lincoln City or Cog Wild Bicycle Tours out of Bend. Here on the longest but least crowded section of Oregon coastline — the 133 miles from Reedsport to Brookings — you can quite possibly have a beach to yourself. Summertime winds typically come from the north, so keep that tailwind at your back. Four mapped routes mean the work is half done for you. 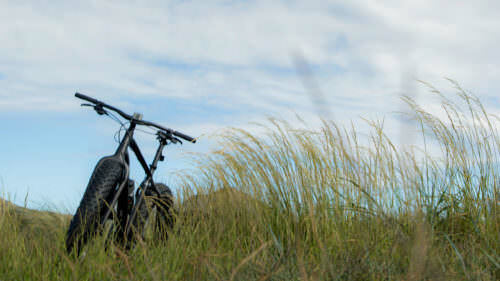 One is ideal for experienced riders, a 13-mile jaunt through the John Dellenback Dunes, in the inland town of Tenmile. As you hit the ocean, the sea birds and salty air in Bandon call. 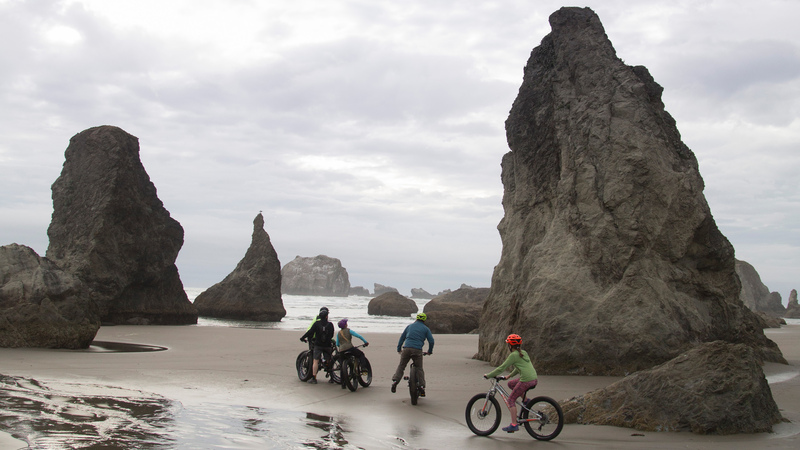 The 19-mile Bandon Fat Bike Beach Ride is full of rugged sea stacks; it connects to the 8.1-mile spectacularly scenic portion from Cape Blanco to Port Orford. Finally a bit further south in Gold Beach, the 10-mile Banana Belt Loop is a stunner, with tidepools and rivers galore. Check out Bandon-based South Coast Bicycles or Port Orford-based Pineapple Express Adventure Rides, which provides guided trip packages and van shuttle service for a convenient return trip. Wherever you go fat biking on the Coast, check the tides and try to go during low tide as much as possible. Beware of sneaker waves and stay off rocks and small, enclosed beaches. Respect the sensitive micro-environments, whether it’s birds or anenome you encounter. In particular, it’s critical for people and pets to avoid areas that are closed due to western snowy plover nesting season, March 15-Sept. 15. Look for bright yellow signs nearby Oregon’s beaches and more info about how to protect this threatened species here).